In this tintype from the Chris Foard collection, Civil War nurse Carrie Wilkins Pollard cared for sick and wounded men in Tennessee, Indiana, Kentucky and on hospital ships, and after hostilities ended she taught orphans. Feedback from previous issues includes the mis-identification of a bird, the re-identification of a pair of ambrotypes of a North Carolina Confederate in the Library of Congress, and the identification of a South Carolina militia company. “Images from Little Connecticut Leave a Big Impression” is a review of Heroes for All Time: Connecticut Civil War Soldiers Tell Their Stories by Dione Longley and Buck Zaidel. 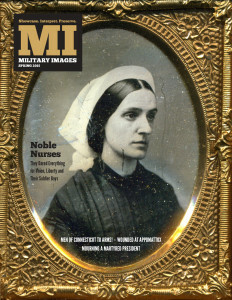 A selection of images of Civil War nurses from the Chris Foard collection. 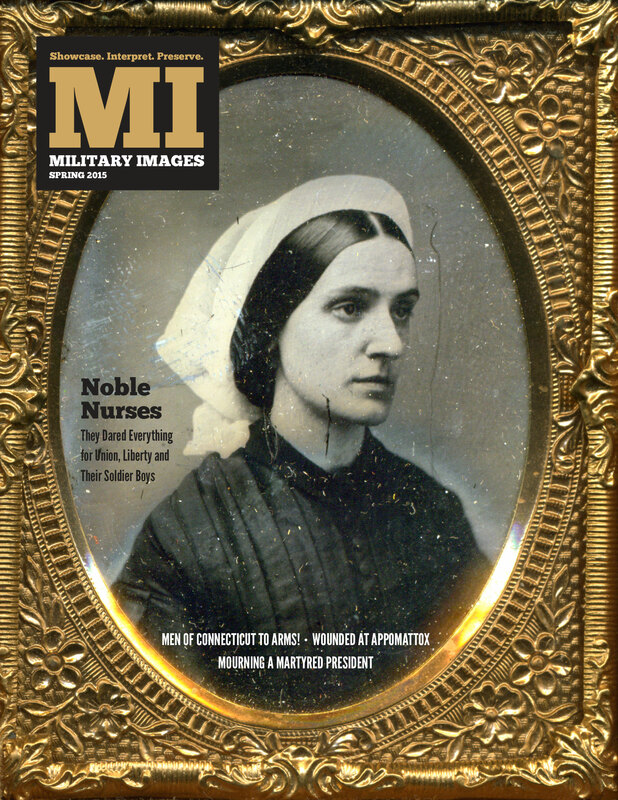 “Whether motivated by patriotism, a calling or the realization that they were needed, nurses became more skilled and confident treating the wounded throughout the entire war. These men and women were the true pioneers of American nursing,” Foard explains in the introduction. Among the images of identified nurses are Annie Etheridge, Almira Fales, Helen Gilson and “Belle” Reynolds. 150 years ago, Northern soldiers observed traditional Victorian fashions and rituals in the wake of the assassination of President and Commander-in-Chief Abraham Lincoln. This photo essay explores the practices through the lens of the citizen soldier. More than 50,000 sons of Connecticut participated in the Civil War, and one in 10 would not survive to tell their stories. Whatever their fate, many left behind their patriotic portraits. A representative sample of images compose this exclusive gallery from Heroes for All Time, a new book by Wesleyan University Press. The tragic fate of two men, a Confederate in Virginia and a federal in Tennessee, at the end of the war. Lt. Charles Minnegerode, an aide to Maj. Gen. Fitzhugh Lee, was shot in the chest and left for dead at Appomattox Court House on April 9, 1865. Lt. Jacob Skirvin of the 7th Indiana Cavalry and a detail of 30 of his comrades got caught in a fierce fight after they were ambushed by Confederate guerillas in Tennessee on April 3, 1865. Pvt. Charles A. Taggart of the 37th Massachusetts Infantry wrested a flag away from a Confederate soldier during the Battle of Sailor’s Creek, Va., on April 6, 1865. He was one of 57 men awarded the Medal of Honor for actions that day—47 of which were presented for the capture of enemy flags. The 154th New York Infantry was nicknamed the Hardtack Regiment. But justifiably, it could also have been called the Hard Luck Regiment. Perhaps its best known soldier, Sgt. Amos Humiston, became famous when he was identified by means of an ambrotype found in his lifeless hand at the Battle of Gettysburg. A history of the regiment told through the stories of five of its members. A shako with a large red and white fountain plume and the brass crossed cannon insignia indicate that the soldier sitting next to it was an artillery militiaman who sat for his daguerreotype between 1854-1860. Included in this selection of images from MI subscribers are two Confederate images by influential photographers: A Confederate navy officer by Charles R. Rees of Richmond, Va., and an infantryman holding his Enfield rifle by George S. Cook of Charleston, S.C.
“Confirmation bias, in which we get fixated on a single, preferred confusion—trust me, it’s a young Robert E. Lee!—leads us to disregard any evidence to the contrary, no matter how compelling,” writes columnist Kurt Luther. He goes on to discuss, using a recent experience of his own, how to blaze a path from confirmation bias to airtight identification. Chevrons are chevrons, right? Not exactly. Mike McAfee shares a sampling of images showing soldiers wearing chevrons of a different stripe. Despite regulations, a surprising number of variations are documented in the visual record of non-commissioned officer portraits from the Civil War period. A quarter-plate ruby ambrotype of Christian Funk and three pals prior to his enlistment in Company H of the 210th Pennsylvania Infantry.